Aria Property Group has submitted a DA for a 18 level residential tower situated at 77 Grey Street, South Brisbane, on the corner of Fish Lane and Grey Streets. According to the DA, the tower is known as ‘Grey Street Tower’ and sits directly opposite the newly renovated Queensland Museum. Like Fish Lane Apartments, which is now under construction, the Grey Street Tower has also been designed to embrace Fish Lane with three new laneway tenancies facing directly onto the Laneway and one bar/lounge facing Grey Street. The retail tenancy sizes range from 30 sqm to 126 sqm for a corner cafe/restaurant. The project features a rooftop recreation deck, complete restoration of a turn-of-the-century character commercial building that will integrate visually within the existing character streetscape to the south and an interchangeable art wall and green wall. 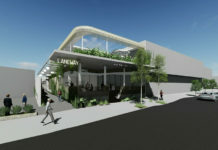 The site is envisaged as a catalyst for Fish Lane development and the starting point for pedestrian linkages through to South Brisbane and West End. Fish Lane has become a key focus of the Brisbane City Council’s vibrant laneways program which sets out to transform underutilized inner city spaces and laneways into loved, vibrant places. Several years ago Archipelago was commissioned by Urban Renewal Brisbane – City Centre Masterplan Team to undertake a public realm concept design for Fish Lane in South Brisbane. The masterplan can be viewed here. The design also seeks to provide a corner retail tenancy fronting the rail line to provide opportunities for open air venue events that may be fleshed out in any future Fish Lane concept developments. The project has been designed by Rothe Lowman architects who also designed Aria’s 30 level Edmondstone Street proposal. The contemporary looking facadism is fantastic. Love that it preserves what was previously there and incorporates it into something new. There should be (and should have been) a lot more of it in development in this city. Developers often have disdain for old buildings, exemplified here. blacknganga, Aria are giving this building an injection of life by restoring the original external brick and creating a vibrant retail environment below. Most developers would simply knock it down, Aria should be congratulated for enhancing the character of the current site. This is a very very good proposal. Well, Eric, if you are a fan of “artifice within architecture”, then this is your cup of tea. I like it when the facade is maintained, gutted, and then made to look as if it was still functional as designed, but here we see what is obviously an historic facade with an unrelated modern building above; they may as well knock the whole thing down, and then knock every early 1900s building in the area down, because this new building ruins the character of that side of the street. There are many better sites for commercial towers. The current building is horribly underutilised and the white paint looks like crap. This is just such a big improvement. Activating fish lane and grey st with ground floor retail will be fantastic. Read more into the DA. This is a resi project, not commercial. I disagree with you guys stating that building look crap with white paint. It look fantastic, especially by the fact that it blends so well with other contract colour paintings and it goes very well with historical building down at the ground floor. It also signifies on how modern it is and how well designed it is. This will revolutionise South Brisbane. Wheelbarrow, I’m saying that the current state of the existing old building (white painted over nice character brick) looks crap. They look like they will sand blast the paint off to reveal its original brickwork which will be fantastic. This is definitely aria’s best project to date! I’m almost 100% certain that retention of the external facade is a requirement due to it’s ‘commercial character’ although it’s not on the heratige register Aria would stuggle to secure DA without it’s incorporation. a full third of the site lies in the flood plain. And it was isolated by the 2011 floods. Some say ‘no development is an island’, but this one will be, every time we have a major rain/flood event. Plus the state govt pulled this site from two previous sale processes. Any suggestion that Sth Brisbane’s multi-billion dollar cultural and social investments havent ‘revitalised’ the suburb are fanciful in the extreme. Aria’s track record is to over-promise and underwhelm in delivery. Being a little more pragmatic, does anyone want to explain the future traffic impacts onto one of the state’s most dangerous intersections right next door at Grey St & Melb St? Like the design but this building looks like it took forever to build.Friend of mine bought into the development and has had to find temporary accommodation for 6 months before he can move it – very inconvenient.